If you’re looking to take on your own pilgrimage - along a route filled with beautiful countryside and rustic villages of Northern Spain - start here, at the Camino de Santiago. 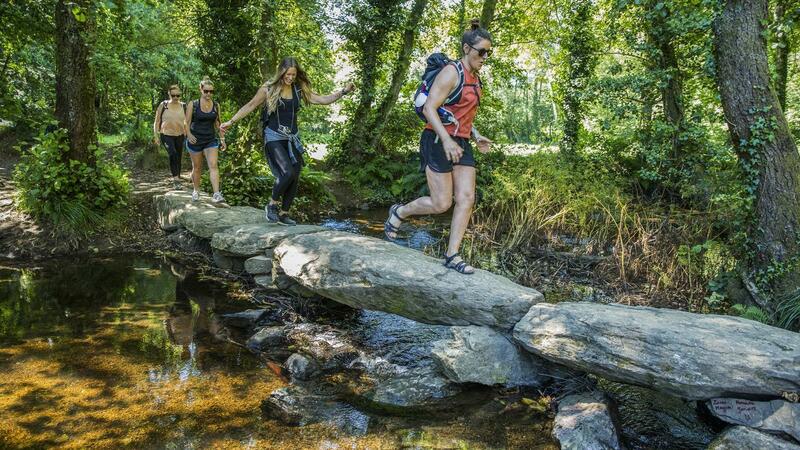 On this eight-day trip, complete the last 100 km of the pilgrimage route to Santiago and receive a "compostela" at the finish to prove your accomplishment. Refuel with tasty Spanish food and take the time to stop and smell the flowers - it’s active but at a slower, more picturesque pace. Welcome meeting in the evening. 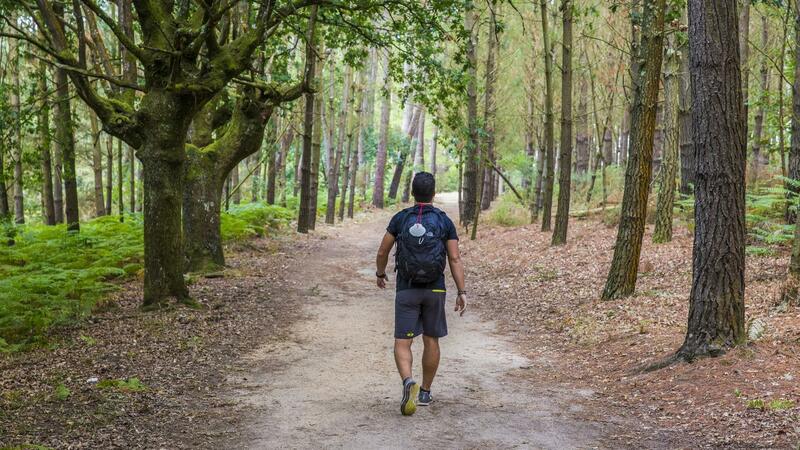 Start hiking from Sarria to Portomarín, covering about 23km (14 mi) over the course of the day. Pass through many lovely towns along the way and choose to have a picnic in places such as Barbadelo, Renta or Ferreiros. Spend the night in the riverside city of Portomarin. Get those walking shoes back on! Leave Portomarin behind in the early light of the morning to make the most of the day. This stretch is a mix of ups and downs through beautiful scenery. The entire area has a rich history, especially during the Middle Ages. Head west and continue the pilgrimage, passing through the lush green valleys of Galicia. Covering about 15 km today, the day again passes through many lovely villages and towns along the way, offering ample opportunity for rest stops and time to pick up any needed supplies before arriving to Melide. Leaving Melide, the Camino crosses several streams and follows a forest track to the village of Boente with its church of Santiago. Next is the scenic medieval village of Ribadiso and finally the town of Arzúa (389m). In Arzúa, visit the churches of Santa María and A Magdalena. Walk through pretty woods, sleepy villages and across streams most of the day. The chapel of Santa Irene, with its unique statue of Santiago, is worth a visit. En-route, don't miss the lovely hamlet of Rúa (310m). The rest of the route to Amenal is along a mix of good and calm country roads and forest tracks. Leave early in order to reach Santiago de Compostela in time for the pilgrim's mass. Walk the last part of the pilgrimage and enjoy the scenery before the baroque, painted towers of the cathedral come into view. Later, explore this fascinating city and sip some wine in a café to celebrate the incredible journey. Upon reaching our goal, the pilgrimage is not complete without a visit to the cathedral on the magnificent Praza do Obradoiro, which houses the supposed tomb of St. James the Apostle. Visit the cathedral on the magnificent Praza do Obradoiro, which houses the supposed tomb of St. James the Apostle. It is widely believed that his remains were buried here in the 1st century AD; from then onwards he became the patron saint of the Christian Crusades. 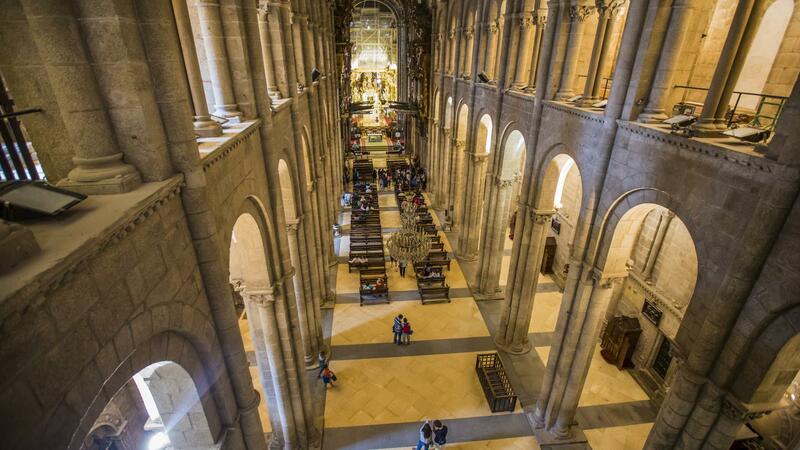 Originally built as a small church over the tomb of St. James in 819AD, this now-grandiose cathedral has remained the end point of the spiritual pilgrimage to those walking the Camino de Santiago. Inside, pilgrims will marvel at the Portico de la Gloria - a carved stone entry way considered to be one of the notable masterpieces of the medieval era - and the awe-inspiring interior of the cathedral. Choose to sit amongst your fellow visitors in contemplation of your journey, or take a walk around to get a closer look at the many artifacts, such as the golden Baroque alter, and the gilded statue of St. James. Take in the beauty of this palace located in the Plaza del Obradoiro. Originally built as a seminary for confessors in 1766, it is the contemporary home of City Hall and the Galician government. Visit the square to marvel at the Fuente de los Caballos - a glorious fountain created in 1825. With the Santiago de Compostela Cathedral in the background, this spot makes for a great photo-op. Departure DayNot ready to leave? Your CEO can help with travel arrangements to extend your adventure. 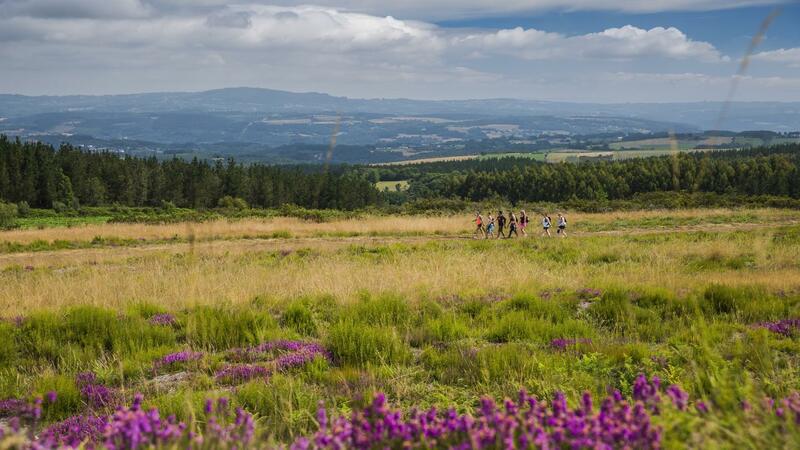 Complete the last 100km of the pilgrim's trail and complete your "compostela"
Trekking along the pilgrimage route of Santiago de Compostela (5 days). Transport between destinations and to/from included activities. 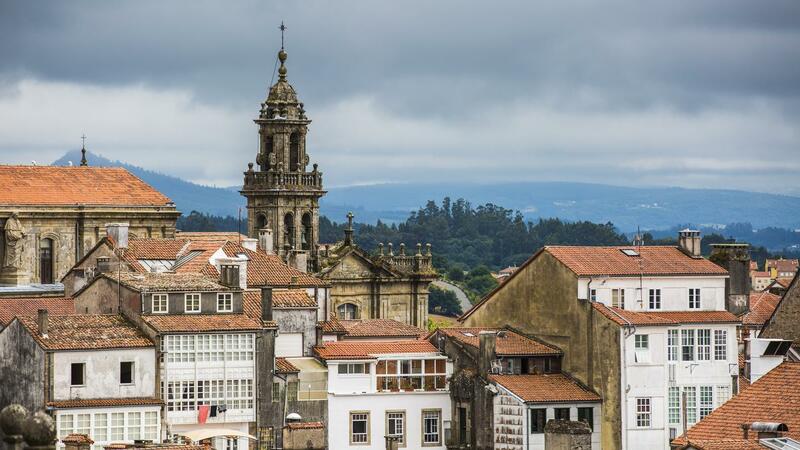 Complete the last 100km of the pilgrim's trail and complete your "compostela", walk through small villages and towns, enjoy hearty and delicious Spanish food, walk into the cathedral in Santiago de Compostela. Please note that after the short bus ride on Day 2, this trip is a trekking trip from start to finish. A support vehicle is available on every day to carry your main luggage, so you will need to have a day pack large enough to fit whatever you require for each day hiking. Please note that only one bag is permitted per traveller, which cannot exceed 20kg/45lbs. LUGGAGE FORWARDING OPTION: If travelling with extra luggage from previous trips or continuing on your travels after the tour, you have the option of forwarding extra luggage to Santiago from Leon for a reasonable fee (approx. 10-30 EUR depending on total weight). Please inquire with your Tour Leader on Day 1. There is also an option to transfer luggage daily to the next night stop, by taxi. This can be arranged with your Tour Leader and is an OPTIONAL service. Cost will be divided between those who choose to use this service. Please note that if you have booked the "My Own Room" option for this tour, you will receive your own single accommodation for all night stops, with the following exceptions: Day 5. Trains run daily to Sarria from Santiago de Compostela (usually via Orense-Empalme), and take about 3.5 hours. Tickets & timetables can be found on http://www.renfe.com/. So, Between Santiago de Compostela and Lugo, there is a direct bus that runs 5 times per day taking about 2 hours and 30 minutes. More information found at www.movelia.es, www.empresafreire.com & tmg.xunta.gal. From Lugo to Sarria, Buses take about 40 minutes & there are about 5 per day. More information found at www.empresafreire.com & monbus.es. We don't expect any problems, and nor should you, but if for any reason you are unable to commence your trip as scheduled, as soon as possible please contact your starting point hotel, requesting that you speak to or leave a message for your trip leader (if you are not on a group tour please refer to the emergency contact details provided in this dossier). If you are unable to get in touch with your leader, please refer to our emergency contact details. If you have pre-booked an airport transfer and have not made contact with our representative within 30 minutes of clearing customs and immigration, we recommend that you make your own way to the Starting Point hotel, following the Joining Instructions. Please apply to your travel agent on your return for a refund of the transfer cost if this occurs. Credit cards and debit cards are very useful for cash advances. Visa cards are the most widely accepted cards. While ATMs are widely available, there are no guarantees that your credit or debit cards will actually work in Western Europe. Check with your bank. You should be aware that to purchase products or services on a credit card a fee of 5%-10% usually applies. Do not rely on credit or debit cards as your only source of money. A combination of euros, travellers cheques and cards is best. Always take more rather than less, as you don't want to spoil the trip by constantly feeling short of funds. Many national governments provide a regularly updated advice service on safety issues involved with international travel. We recommend that you check your government's advice for their latest travel information before departure. We strongly recommend the use of a neck wallet or money belt while travelling, for the safe keeping of your passport, air tickets, travellers' cheques, cash and other valuable items. Leave your valuable jewellery at home - you won't need it while travelling. Many of the hotels we use have safety deposit boxes, which is the most secure way of storing your valuables. A lock is recommended for securing your luggage. When travelling on a group trip, please note that your group leader has the authority to amend or cancel any part of the trip itinerary if it is deemed necessary due to safety concerns. Your leader will accompany you on all included activities. During your trip you will have some free time to pursue your own interests, relax and take it easy or explore at your leisure. While your group leader will assist you with options available in a given location please note that any optional activities you undertake are not part of your itinerary, and we offer no representations about the safety of the activity or the standard of the operators running them. Please use your own good judgement when selecting an activity in your free time. Although the cities visited on tour are generally safe during the day, there can be risks to wandering throughout any major city at night. It is our recommendation to stay in small groups and to take taxis to and from restaurants, or during night time excursions. Our small group adventures bring together people of all ages. It is very important you are aware that, as a minimum, an average level of fitness and mobility' is required to undertake our easiest programs. Travellers must be able to walk without the aid of another person, climb 3-4 flights of stairs, step on and off small boats, and carry their own luggage at a minimum. Travellers with a pre-existing medical condition are required to complete a short medical questionnaire, which must be signed by their physician. This is to ensure that travellers have the necessary fitness and mobility to comfortably complete their chosen trip. While our leaders work hard to ensure that all our travellers are catered for equally, it is not their responsibility to help individuals who cannot complete the day's activities unaided. Please refer to the physical ratings in this Trip Details document for more information. Eating is a big part of traveling. Travelling with G Adventures you experience the vast array of wonderful food that is available out in the world. Generally meals are not included in the trip price when there is a choice of eating options, to give you the maximum flexibility in deciding where, what and with whom to eat. It also gives you more budgeting flexibility, though generally food is cheap. Our groups tend to eat together to enable you to taste a larger variety of dishes and enjoy each other's company. There is no obligation to do this though. Your group leader will be able to suggest favourite restaurants during your trip. For all trips please refer to the meals included and budget information for included meals and meal budgets.